One of our favorite wedding gifts was a backyard fire pit and in the four years since then, we’d made use of it as much as we can. This fall, we really failed. One weekend we stocked up on a bunch of firewood and s’mores fixings, only to have an insanely warm October evening where we were all sweating without the help of a fire. In the weeks that followed, we kept looking for another fire opportunity but couldn’t seem to find a free night…until suddenly it was too cold to sit outside—fire or not! So what’s a girl to do with graham crackers, marshmallows, and chocolate bars, but no fire to turn them into s’mores?! Make indoor chocolate covered s’mores of course! 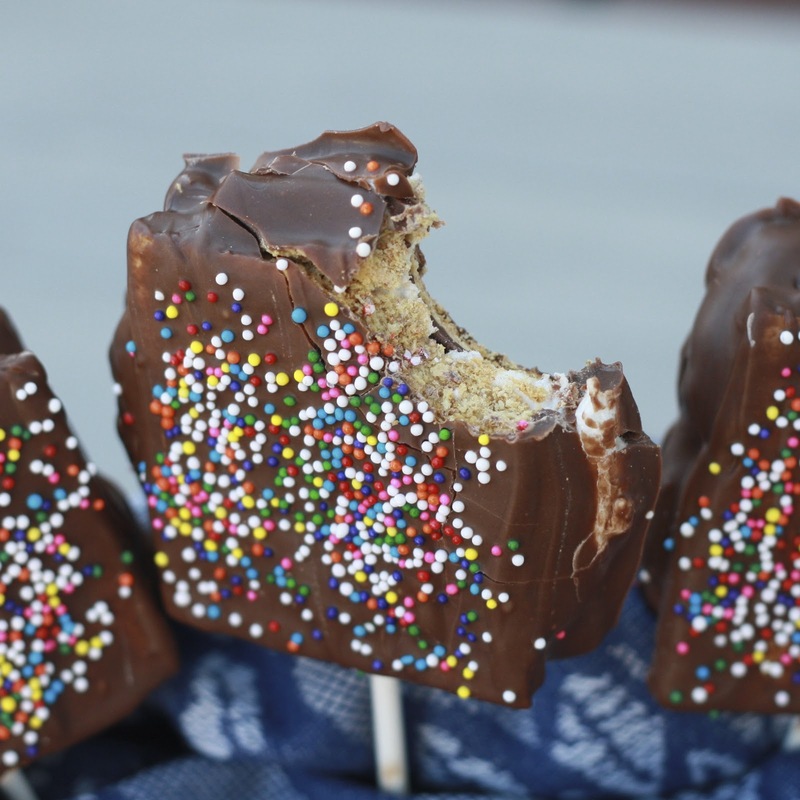 These s’mores on a stick lacked the nostalgia of sitting around the glow of a fire watching your marshmallow puff up and brown, but one bite and you’ll have forgotten how they were made! Heating the s’mores in the oven makes for perfectly browned marshmallows (no burnt ones in sight!) and coating the entire s’more in an extra layer of chocolate turns this beloved treat into something downright decadent. You could omit the sticks if you prefer, but it did make it easier to hold and dip the s’mores. 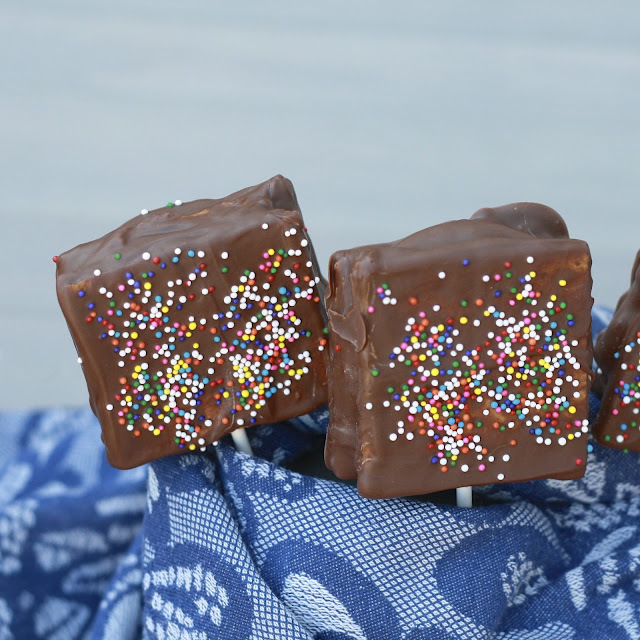 I get a little worried about chocolate-dipped anything because mine always turn out so much sloppier and messy looking than I intend, but these couldn’t have been easier. Go heavy on the sprinkles if you need to cover up any mistakes! If you don’t have a fire pit or you, like us, missed out on s’mores season, chocolate covered s’mores are just what you need! 1. Preheat oven to 400F. Line a baking sheet with foil and top with an even number of graham crackers (2 rectangles--1 square). 2. Top each square with either a marshmallow or a piece of chocolate. Place baking sheet in oven for about 5 minutes, until marshmallows start to lightly brown (watch closely--your oven may differ). 3. Form s'mores by pressing together graham cracker with chocolate and graham cracker with marshmallow. Place a lollipop stick into the marshmallow part of each one. Place baking sheet in freezer for at least 30 minutes, until s'mores harden. 4. Melt almond bark in the microwave according to package instructions. Holding the s'more by the lollipop stick, dip s'mores in melted chocolate, using a fork to fully cover s'more and smooth chocolate. 5. 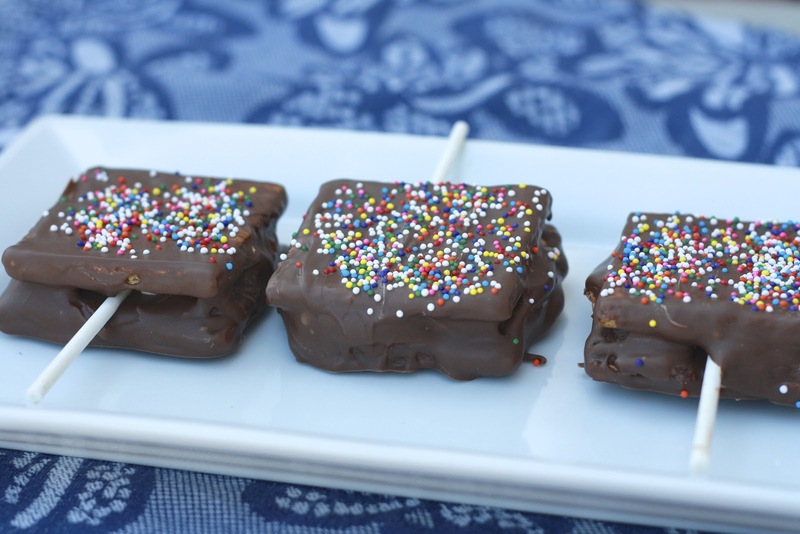 Place dipped s'mores on a baking sheet lined with wax paper. Allow chocolate to set before serving. Store in an airtight container.